I never had a trampoline but I always wanted one. I got to try one out at this mini golf park. The trampoline was part of a weird one on one basketball type game. There was a mesh screen dividing the trampoline in half and there was a basket above each person’s head higher up than the barrier. The whole thing was then surrounded by the same mesh fabric, so there was no danger of flying balls or children. So each person had to jump high enough to get their ball over the barrier and past the blocking hands of their opponent. It was fun but my knuckles got burned up dragging on that mesh as we bounced around. i looooooove trampolines.. when i was a kid i would run home evry arvo to my trampoline.. best times ever!! dunno about cleaning the windows with one though, Chris. p.s. that game sounds so funnnnnn!!! Trampolines rock! My brothers and I used to jump on ours all the time until our “slightly-overweight” cousin and her friends broke all the damn triangular metal thingies that attached the springs to the mat. Cleaning second story windows while on a trampoline does not work. Trust me. Yeah, my neighbors used to have one and then they got all whiny about people getting hurt and possibly suing them, so they required us to sign a release form to use their trampoline. So we didn’t use it anymore, and then their “slightly-overweight” kids broke it. Long story short, don’t feed your kids Crisco, and they should stay a healthy weight. Biff seems to be wearing a fairly large sweater….is it cold? if so washing the windows can always wait ’till it’s warm. ……….What happens if the tampoline below breaks? 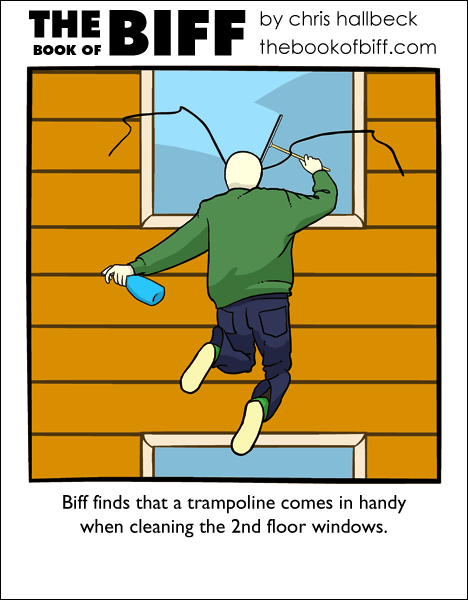 I doubt Biff would care though worse as happened to him. your legs. Good stuff right there good stuff. I miss my trampoline, I used to get bedsheets and hold two edges in each hand then jump off from 10 feet in the air and attempt to parachute down, I think it worked once, other times I usually injured myself..
Blargen-Vargen, I used to do that with plastic bags ending with the same results as yours. I love his stance! great comic! Trampolines on a basketball court? Sounds like Slamball to me. I watched a few games, it looks pretty fun. Ahrgh…I always wanted to have a trampoline when i was a kid. Then, When I was so dissapointed that I really didn’t want one anymore, my parents bought one. I never wanted to play on it, and it always made me irrationally angry to see it sitting, disused, in the yard. I vowed, from that day on, that i would buy one for my kid(s). Now it turns out i can’t have any. AAAARRRRGGGGHHHHH. that pose is AWESOME haha, I love the idea too. It would just take a while. I remember going to the fair and I used to ride elephants and jump on trampolines. I was a rough and tumble type. I must have been the only one who would wet down a trampoline and pour dishwashing soap on it, making it into the most dangerous slip and slide anywhere. Whenever it started raining my Mom would hide the soap. Fun but realy dangerous. O_O; Soapy Trampoline!? You must be nucking futs! On trampolines, I’ve been kneed in the eye, headbutted in the stomach, and thrown off onto a hill with rocks jutting out of it. Another was knocked off, and yet another broke his arm. Maybe you shouldn’t have 6 people on at once…. You can use trampolines?! I always hang out horizontally with my feet chained to the windowsill!